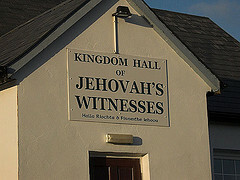 While the COGs rarely own church buildings, Jehovah’s Witnesses normally do. A crucial time was drawing close. In 1876 the Bible student Charles Taze Russell contributed the article “Gentile Times: When Do They End?” to the Bible Examiner, published in Brooklyn, New York, which said on page 27 of its October issue, “The seven times will end in A.D. 1914.” The Gentile Times is the period referred to in another Bible translation as “the appointed times of the nations.” (Luke 21:24) Not all that was expected to happen in 1914 did happen, but it did mark the end of the Gentile Times and was a year of special significance. One modern historical difference is that the JWs moved away from electronic media about the same time that the COGs embraced it. The COGs do not consider 1914 to be nearly as significant as the JWs do. Based upon discussions I have had with individual witnesses, it seems that the Jehovah’s Witnesses seem to teach that after the apostles an apostasy set in (that is true), that somehow some true believers remained (that is true), but that it really does not know who or where the true church was until the 1800s. The historical foundation for the JWs is weak (those who do not know where they came from are not likely to know where they are going either–JWs and non-COG types should ponder that). Hence the JWs tend to have a gap in history from around the end of the first century (the “full apostasy” per the JWs occurred in the fourth century, but I have not seen them attempt to trace themselves through leaders after those listed in the New Testament until the nineteenth century) to the mid-late nineteenth century. This differs from the COG. Two articles that discuss the COGs throughout history would include History of Early Christianity and The Churches of Revelation 2 & 3. Unlike the Jehovah’s Witnesses, the COGs do not believe that the final appointed time (which is the subject of Daniel 11:27,29, 35) nor the great tribulation (Matthew 24:21) began in 1914 (nor do the COGs teach that either has yet begun). What were the consequences for the human family? The prophecy continues: “Woe for the earth and for the sea, because the Devil has come down to you, having great anger, knowing he has a short period of time.” Yes, Satan knows that his system is nearing its end, so he is doing everything he can to turn humans against God before he and his world are put out of the way. (Revelation 12:12; 20:1-3) How debased those spirit creatures are because they misused their free will! How awful conditions have been on earth under their influence, especially since 1914! (How We Know We Are in “the Last Days”. Jehovah’s Witnesses Official Web Site. Published in 1992. Copyright © 2006 Watch Tower Bible and Tract Society of Pennsylvania. http://www.watchtower.org/library/dg/article_09.htm 07/23/07). When Jesus was on earth, he proved that he would be a kind, just, and perfect Ruler. When he returned to heaven, he was not enthroned as King of God’s Kingdom right away. (Hebrews 10:12, 13) In 1914, Jehovah gave Jesus the authority He had promised him. Since then, Jesus has ruled in heaven as Jehovah’s appointed King.—Daniel 7:13, 14…As soon as Jesus became King, he threw Satan and his wicked angels out of heaven and down to the locality of the earth. That is why things have become so bad here on earth since 1914. (Revelation 12:9, 12) (What Is the Kingdom of God? Jehovah’s Witnesses Official Web Site. Published in 1996. Copyright © 2006 Watch Tower Bible and Tract Society of Pennsylvania. http://www.watchtower.org/library/rq/article_06.htm 07/23/07). The time that God has allowed for humans to experiment with self-government is about to end. In fulfillment of Bible prophecy, his Kingdom was established in the heavens in 1914 with Jesus Christ as its King. # Shortly, it will crush and put an end to all human governments.—Daniel 2:44 (Why Does God Allow Us to Suffer? Jehovah’s Witnesses Official Web Site. Appeared in The Watchtower January 1, 2003. Copyright © 2006 Watch Tower Bible and Tract Society of Pennsylvania. http://www.watchtower.org/library/w/2003/1/1/article_02.htm 07/23/07). …when Jesus spoke of today’s troubled system and “the sign” of its approaching destruction, he added, “This generation will by no means pass away until all these things occur.” Some, at least, of the generation that saw the “beginning of pangs of distress” in 1914 will live to see Paradise restored on earth. (Matthew 24:3-8, 34) (Education for Entering Paradise. Jehovah’s Witnesses Official Web Site. Published in 1986. Copyright © 2006 Watch Tower Bible and Tract Society of Pennsylvania. http://www.watchtower.org/library/lmn/article_11.htm 07/23/07). One source claimed that JW literature states that Jesus began “his invisible rule over the earth in 1914” (The Truth Shall Make You Free, p. 300. Cited at carm.org), and though I have not seen that precise quote, it could be consistent with the above claims. But if so, this would seem to contradict their official belief that “Satan is invisible ruler of world”. However, the JW written position seems to be that what is happening now is that Satan has been thrown down to earth since 1914, even though the Father gave Jesus the kingdom rulership then. But the Bible and the COGs teach that the great tribulation that Revelation discusses is 3 1/2 years long and that period ends with Christ’s return (some feel it is possibly seven). What the Jehovah’s Witnesses seem to teach is that amount of the time from Satan being sent to the earth in 1914 and until Christ returns has been from over 93 years thus far (hence this seems to contradict their translation of Revelation 12 that Satan’s great anger is for “short period of time“). Also, the expression that Jesus mentioned about a particular “generation” would suggest that the timeframe probably could not be something like 100 years. The Jehovah’s Witnesses are clearly in error on many of their 1914 points. 13 Now when the dragon saw that it was hurled down to the earth, it persecuted the woman that gave birth to the male child. 14 But the two wings of the great eagle were given the woman, that she might fly into the wilderness to her place; there is where she is fed for a time and times and half a time away from the face of the serpent (NWT). A “time and times and half a time” is 3 1/2 years, not over 93 years (and by the time Jesus comes, it will likely have been over 100 years). Three and one half years makes a lot more sense for that short period of time. Satan and the demons are now severely restricted. They can no longer materialize as they apparently once could. Shortly after the establishment of God’s Kingdom in the hands of Christ in 1914, they were cast down to the vicinity of the earth.—Revelation 12:7-9 (THE DEVIL More Than Just Superstition. Jehovah’s Witnesses Official Web Site. Appeared in The Watchtower September 1, 2001. Copyright © 2006 Watch Tower Bible and Tract Society of Pennsylvania. http://www.watchtower.org/library/w/2001/9/1/article_02.htm 07/23/07). So since the JWs teach that Satan was thrown down in 1914 and that this was shortly after Jesus received the Kingdom in 1914, it makes no sense that they teach that the short time that Satan was thrown down for is at least 93 years. Since the JWs seem to teach that Jesus received “Kingdom power” in 1914, this sort of reminds me of what the Seventh-day Adventists (SDA) and other Adventists called the great disappointment (when Adventists were disappointed that Jesus did not come when they thought He would). After the “great disappointment”, Ellen Harmon (who became Ellen White) essentially taught that Jesus came not to the earth, but to a sanctuary and that this began a time of investigative judgment (this, thus was how they explained the error in the Advent–not that their date was wrong, but that would happened was misunderstood). Russell adopted many of his doctrines from the Seventh-Day Adventists, but the JWs began to emphasize door-to-door evangelism and literature distribution after Russell’s death and subsequent leadership assumption by Joseph Franklin Rutherford (Jehovah’s Witnesses: Christian or Cult? * Biblical Discernment Ministries – Revised 11/01. http://www.rapidnet.com/~jbeard/bdm/Cults/jw.htm). Both the JWs and COGs believe that there have been true Christians throughout history. However, a major difference is that the COGs believe that they can identify many of them essentially throughout history, while the Jehovah’s Witnesses do not attempt to do that. There was also nothing in the JW official website that provided earlier history than I was able to locate when I last looked. Did the Roman Catholic Church Change Its Views on Abortion? While we in the Church of God are opposed to involuntary abortion, has the Roman Catholic Church always been opposed to abortion? Since the first century the Church has affirmed the moral evil of every procured abortion. This teaching has not changed and remains unchangeable. Direct abortion, that is to say, abortion willed either as an end or a means, is gravely contrary to moral law (Catechism of the Catholic Church, #22710. Imprimatur Potest +Joseph Cardinal Ratzinger. Doubleday, NY 1995, p. 606). For even also he permitted females, if they were unwedded, and burned with passion at an age at all events unbecoming, or if they were not disposed to overturn their own dignity through a legal marriage, that they might have whomsoever they would choose as a bedfellow, whether a slave or free, and that a woman, though not legally married, might consider such a companion as a husband. Whence women, reputed believers, began to resort to drugs for producing sterility, and to gird themselves round, so to expel what was being conceived on account of their not wishing to have a child either by a slave or by any paltry fellow, for the sake of their family and excessive wealth. Behold, into how great impiety that lawless one has proceeded, by inculcating adultery and murder at the same time! (Hippolytus. Refutation of All Heresies, Book IX, Chapter VII. Excerpted from Ante-Nicene Fathers, Volume 5. Edited by Alexander Roberts & James Donaldson. American Edition, 1886. Online Edition Copyright © 2005 by K. Knight). So early religious writers considered abortion to be murder. And fornication to be adultery. The Bible does not given anyone the right to commit fornication, adultery, nor murder. And abortion is murder. Most Catholics are not aware that the infallible Church and popes have changed their minds several times on this topic–unthinkable from today’s perspective. From the fifth century onward, Aristotle’s view that the embryo goes through stages from vegetable to animal to spiritual was accepted. Only in the final stage was it human. Thus Gregory VI (1045-6) said, “He is not a murderer who brings about abortion before the soul is in the body.” Gregory XIII (1572-85) said it was not homicide to kill an embryo of less than 40 days since it wasn’t yet human. His successor, Sixtus V, who rewrote the Bible, disagreed. His Bull of 1588 made all abortions for any reason homicide and cause for excommunication. His successor, Gregory XIV, reversed that decree. In 1621 the Vatican issued another pastoral directive permitting abortion up to 40 days (Hunt D. A Women Rides the BeastHarvest House Publishers, Eugene (OR), 1994, pp. 519-520). From the fifth century, the church accepted without question, the primitive embryology of Aristotle. The embryo began as a non-human speck that was progressively animated. Gregory XIII (1572-85) said it was not homicide to kill an embryo of less than forty days since it was not human…His successor, the tempestuous Sixtus V, who rewrote the Bible, disagreed entirely. In his Bull Effraenatum of 1588, he said all abortions for whatever reason were homicide and were penalized by excommunication reserved to the Holy See. Immediately after Sixtus died, Gregory XIV realized that, in the current state of theological opinion, Sixtus’ view was too severe. In an almost unique decision, he said Sixtus’ censures were to be treated as if he had never issued them (De Rosa, Peter. Vicars of Christ. Poolbeg Press, Dublin, 2000, p.p 374-375). Although there is no evidence that any Church of God leader endorsed abortion, sadly some affiliated with the Roman Church have. Posted in Doctrine | Comments Off on Did the Roman Catholic Church Change Its Views on Abortion? The Churches of God normally have over one hundred Feast of Tabernacles’ sites in various places around the world every year. I began to attend the Feast of Tabernacles in 1977. My first feast was at Squaw Valley, California, with an attendance of around 10,000 (all attendance figures will be from my memory of estimated attendance), and this was when I saw Garner Ted Armstrong in person. In 1978, I went to Fresno, California, with an attendance of around 7,000. In 1979, I went to Tucson, Arizona for the feast, with an attendance of nearly 12,000 and this is when I saw Herbert W. Armstrong in person and met Stan Radar. In 1980, I attended the feast in Big Sandy, Texas and slept in a small tent–it rained a lot and this was quite wet–about 7,000 may have attended there that year. In 1981, this was the first feast I did not drive to, it was Lihue, Hawaii, with about 1,500 in attendance–this was the first time my wife and I were married and attended the same Feast site. In 1982, we went to Anchorage, Alaska with about 500 in attendance. In 1986, we went to Pasadena, California for the Feast. We did not take slides, but should we find the photos taken, perhaps they will be added. One thing that puzzled me in 1986, was the fact that I learned that J. Tkach (Sr.) generally did not go anywhere for the Feast of Tabernacles. Later, of course, he and his administration minimized the necessity to observe God’s festivals. The biblical Feast of Tabernacles begins tonight at sunset. This year, my family and I are planning on attending in Tobago. Tobago is a small island north of South America and is part of the nation of Trinidad and Tobago. As they speak English, we expect that it will more like a Caribbean nation than a Latin one. Because of this, Christians in the tend to go somewhere for the Fall festivals. The primary (if not only) location for the old Radio Church of God (which became the old Worldwide Church of God) was in Belknap Springs, Oregon. Herbert W. Armstrong attended the feast of Tabernacles there from at least 1946-1951 (he may have also attended there in later years). In the 21st century, the Living Church of God normally has had at least 40 festival locations each year around the world (Living Church of God’s 2007 Feast of Tabernacles’ Information). Our family has been to Australia, the Bahamas, Barbados, Belgium, Canada, Fiji, Greece/Turkey, Guatemala, Italy, Jamaica, Malaysia, the Netherlands, New Zealand, Sri Lanka, South Africa, the United Kingdom, and various states in the USA for the Feast of Tabernacles (all in different years, except Greece and Turkey which was combined via a cruise). In later posts in the next few days, I expect to mention even more locations that we have visited to attend the Feast of Tabernacles. Normally, (at least at Feast sites held within the Living Church of God) attendees at the Feast go to church services for two hour most days, and normally have two or three services on the Holy Days (first day of the Feast, the Sabbath, and the Last Great Day). Sermons often focus on the Kingdom of God, the law of God, and the Millennial reign of Christ, though pretty much any topic of Christian interest can be covered. The time not at services or church activities is essentially free time, and people tend to go to restaurants, go sight-seeing, participate in local activities, or otherwise attempt to enjoy being away from most of the cares of their normal lives. The Apostle John is believed to have lived until around 100 A.D., the end of the first century. Since he was the last of the original apostles to die, what were the beliefs of those faithful leaders shortly after he died? In other words, what were the beliefs of the true Christians in the second century? You may be surprised to learn that they are very different in many key areas to the beliefs of the majority of people in the 21st century who profess Christ. Pentecost was kept on the same day that the Jews observed it by all professing Christians. More information about what happened to the true Church can be found in the article The History of Early Christianity. Posted in Church History | Comments Off on What Did the Second Century Church Believe? Although Roman Catholics claim a variety of early Church leaders as their own, the truth is that they have no real proof that most of the so-called “bishops of Rome” held that office. Furthermore, even though they and the Eastern Orthodox consider that Melito of Sardis (of the second century) is a Christian saint, the fact is that he held doctrinal positions currently held by the COGs that are not held (and in some cases even denounced) by the Roman Catholic and Eastern Orthodox churches. Do you know much about Melito of Sardis? Because if he is truly a saint like the Roman Catholic and Eastern Orthodox churches claim, then if he was preaching the truth then those teachings should still held. For there are some men who are unable to rise from their mother earth, and therefore also do they make them gods. from the earth their mother; and they are condemned by the judgments of truth, forasmuch as they apply the name of Him who is unchangeable to those objects which are subject to change, and shrink not from calling those things gods which have been made by the hands of man, and dare to make an image of God whom they have not seen (Melito. Translation by Roberts and Donaldson. A DISCOURSE WHICH WAS IN THE PRESENCE OF ANTONINUS CAESAR, AND HE EXHORTED THE SAID CAESAR TO ACQUAINT HIMSELF WITH GOD, AND SHOWED TO HIM THE WAY OF TRUTH. Online version copyright © 2001 Peter Kirby. http://www.earlychristianwritings.com/text/melito.html 9/04/05). We are not those who pay homage to stones, that are without sensation; but of the only God, who is before all and over all, and, moreover, we are worshippers of His Christ, who is veritably God the Word existing before all time (From the apology addressed to Marcus Aurelius Antoninus. Verse III. Online version copyright © 2001 Peter Kirby. http://www.earlychristianwritings.com/text/melito.html 9/10/05). An article of possible interest may be What Did the Early Church Teach About Idols and Icons? And then shall those who have not known God, and those who have made them idols, bemoan themselves, when they shall see those idols of theirs being burnt up, together with themselves, and nothing shall be found to help them (Melito. Translation by Roberts and Donaldson. A DISCOURSE WHICH WAS IN THE PRESENCE OF ANTONINUS CAESAR, AND HE EXHORTED THE SAID CAESAR TO ACQUAINT HIMSELF WITH GOD, AND SHOWED TO HIM THE WAY OF TRUTH. Online version copyright © 2001 Peter Kirby. http://www.earlychristianwritings.com/text/melito.html 9/04/05). Notice that Melito clearly condemned those who made idols and apply the name of God to them. Notice that he also taught that believing they are acceptable because of the traditions of fathers is in error. …a large number of Christians of the post-Apostolic era, particularly in Asia Minor, yielded so far to Jewish apocalyptic as to put a literal meaning into these descriptions of St. John’s Apocalypse; the result was that millenarianism spread and gained staunch advocates not only among the heretics but among the Catholic Christians as well…Papias of Hierapolis, a disciple of St. John, appeared as an advocate of millenarianism. He claimed to have received his doctrine from contemporaries of the Apostles…A witness for the continued belief in millenarianism in the province of Asia is St. Melito, Bishop of Sardes in the second century (Kirsch J.P. Transcribed by Donald J. Boon. Millennium and Millenarianism. The Catholic Encyclopedia, Volume X. Copyright © 1911 by Robert Appleton Company. Online Edition Copyright © 2003 by K. Knight. Nihil Obstat, October 1, 1911. Remy Lafort, S.T.D., Censor. Imprimatur. +John Cardinal Farley, Archbishop of New York). Yet the Roman Catholic and Orthodox churches also teaches against this. 676 The Antichrist’s deception already begins to take shape in the world every time the claim is made to realize within history that messianic hope which can only be realized beyond history through the eschatological judgment. The Church has rejected even modified forms of this falsification of the kingdom to come under the name of millenarianism, especially the “intrinsically perverse” political form of a secular messianism. (Catechism of the Catholic Church. Imprimatur Potest +Joseph Cardinal Ratzinger. Doubleday, NY 1995). CHILIASM: Chiliasm, from the Greek word meaning “1000,” is a belief based on Revelation 20:2-7. In its classical form (which interprets the Revelation 20 verses verbatim), Chiliasm teaches that Satan will be bound by Christ for 1000 years, at which time Jesus and the Saints will reign on earth, and after which, Satan will be finally defeated and the Eternal Kingdom of God will be inaugurated. In modern times, Chiliasm has been “boiled down” to the teaching that the world will end after one thousand years (or a number of years that is a multiple of one thousand). Though some Ancient Church Fathers of the first three centuries AD had Chiliast leanings, the Orthodox Church formally denounced Chiliasm at the Second Ecumenical Council, in 381 (Orthodox Christian Beliefs and Practices. © 2006-2007 Ukrainian Orthodox Church of Canada. http://www.uocc.ca/en-ca/faith/beliefs/ 08/18/07). In other words, both groups condemn Melito’s teaching on this. Orthodox Church scholars know that early Christian leaders, which it calls, “Ancient Church Fathers” taught chiliasm (called millenarianism in Latin), yet it CHANGED that teaching in a church council. Roman Catholic scholars know this as well More information can be found in the article Did The Early Church Millenarianism?. Furthermore, Melito held many other COG doctrines. Many doctrines that are now opposed by the Roman Catholic and Eastern Orthodox churches. VATICAN CITY, SEPT. 19, 2007 (Zenit.org).- Benedict XVI sent the Chief Rabbi of Rome a message for the Jewish festivities celebrated this month. The Pope expressed in a message his “most cordial and sincere best wishes” to Rabbi Riccardo Di Segni and the entire Jewish community in Italy’s capital. While I am pleased with public statements of support for the biblical Holy Days, the above statements from Pope Benedict seem to strongly disagree with the position of the Roman Church as taught earlier by one of its saints John Chrysostom. The festivals of the pitiful and miserable Jews are soon to march upon us one after the other and in quick succession: the feast of Trumpets, the feast of Tabernacles, the fasts. There are many in our ranks who say they think as we do. Yet some of these are going to watch the festivals and others will join the Jews in keeping their feastsand observing their fasts. I wish to drive this perverse custom from the Church right now…If the Jewish ceremonies are venerable and great, ours are lies…Does God hate their festivals and do you share in them? He did not say this or that festival, but all of them together. (John Chrysostom. Homily I Against the Jews I:5;VI:5;VII:2. Preached at Antioch, Syria in the Fall of 387 AD. Medieval Sourcebook: Saint John Chrysostom (c.347-407) : Eight Homilies Against the Jews. Fordham University. http://www.fordham.edu/halsall/source/chrysostom-jews6.html viewed 12/10/05). Today is the Day of Atonement (Yom Kippur) and it is not a wicked nor unclean fast–at least not according to the Bible. John Chrysostom preached against the Fall Holy Days in the 4th century, because some who professed Christ were observing them. It is interesting to note that he must have realized that the second century church kept Passover the same time as the Jews did (this was even true in the early second century in Rome). And that the Catholic Church still kept Pentecost. Thus by preaching what he did, John Chrysostom is preaching against his own church as the Catholics claim to keep both Passover (though on a different date, and with a different name) and Pentecost–as both of those festivals would be part of “all of them together”. But contrary to the implications of John Chrysostom, the facts are that the Holy Days were kept by Jesus, the New Testament Church, and those faithful to their teachings. And the other fact is that no where in the Bible do we see hatred against the Jews. Jesus taught we were to love our neighbor (and most the of “neighbors” He was then talking to were Jewish). There are very few “Doctors of the Church” from a Roman Catholic perspective, but this hater of Jews and God’s Holy Days–John Chrysostom–was one of them! So why did I bring up John Chrystostom’s and the Pope’s comments together? Because the Pope himself brought up both subjects (Chrysostom and the biblical Holy Days) essentially on the same day! According to a 9/20/07 article by Zenit, on Wednesday (September 19, 2007) the Pope’s “reflection at the general audience focused on St. John Chrysostom”. In other words he publicly reflected on the contributions he believed that Chrysostom made to his church, the same day it was reported that he sent a letter to the Roman Rabbi praising God’s Holy Days. As you can see, dear brothers and sisters, this lesson of Chrysostom on the authentically Christian presence of the lay faithful in the family and in society, is important today more than ever. Let us pray that the Lord render us docile to the lessons of this great teacher of the faith. So on the same day, it seems that the Pontiff praised one who hated Jews and God’s Holy Days, then claimed that the Holy Days as observed by Jews can be a source of blessings from God. Should we pray related to John Chrysostom, as the Pope stated, to be “docile to the lessons of this great teacher of the faith“–a hater of Jews and God’s Holy Days? Or pray for the Kingdom of God to come and to point out the absurdity of what is happening in Rome? Posted in Church History, Doctrine | Comments Off on Pope Praises God’s Holy Days? The Day of Atonement, called Yom Kippur in Hebrew, begins tonight at sunset. And the LORD spoke to Moses, saying: “Also the tenth day of this seventh month shall be the Day of Atonement. It shall be a holy convocation for you; you shall afflict your souls…It shall be to you a sabbath of solemn rest, and you shall afflict your souls; on the ninth day of the month at evening, from evening to evening, you shall celebrate your sabbath (Leviticus 23:26-27,32). In the New Testament, the Day of Atonement is referred to as “the Fast” (Acts 27:9). One “step in God’s Master Plan is for the peoples of the earth to become “at one” with God. Then they can willingly learn God’s ways and be blessed. But today, the nations are rebelling against God and His ways because they have been DECEIVED. In His wisdom and infinite mercy, God has made all human beings free moral agents. He knew that mankind would desperately want to try to do things his own way before finally learning that GOD’S way is right. Therefore, God has allowed humanity to be deceived—to be mainly “cut off” from God through these past 6,000 years of human history. Jesus’ return as King of kings is described in Revelation 19:11–21. Then, in Revelation 20, we read that a mighty angel is appointed to remove Satan. “He laid hold of the dragon, that serpent of old, who is the Devil and Satan, and bound him for a thousand years; and he cast him into the bottomless pit, and shut him up, and set a seal on him, so that he should deceive the nations no more till the thousand years were finished. But after these things he must be released for a little while” (vv. 2–3). Clearly Satan—the “Azazel” or adversary—is CUT OFF from humanity so he is unable to DECEIVE mankind during the one thousand year reign of Christ! That is why humanity will quickly become “at one” with God’s ways—NO MORE SATANIC INFLUENCE. That is why, during the glorious reign of Christ, “They shall not hurt nor destroy in all My holy mountain, for the earth shall be full of the knowledge of the Lord as the waters cover the sea” (Isaiah 11:9). And Isaiah further explains how at the time the blindness of humanity is fully removed, “He will destroy on this mountain the surface of the covering cast over all people, and the veil that is spread over all nations. He will swallow up death forever, and the Lord God will wipe away tears from all faces; the rebuke of His people He will take away from all the earth; for the Lord has spoken” (25:7–8). So with “Satan’s Broadcasting System” shut down and the BLINDNESS of humanity removed, man can indeed become “at one” with God. For Christ will have paid our part in our sins, but Satan the Devil will certainly be utterly banished to a symbolic “wilderness” or “bottomless pit” and be restrained and held in this kind of a prison for his part in our sins. God is just! He will place on Satan’s own head the enormous GUILT he bears for stirring up mankind against God, for DECEIVING humanity into thinking God is “unfair” and that His laws and righteous ways are not good. Finally, again, humanity will learn to APPRECIATE God and His ways, to genuinely LOVE and WORSHIP the true God of the Bible. For at this point, the “atonement” for humanity’s sins will be complete” (Meredith RC. The Holy Days – God’s Master Plan. LCG booklet). The Day of Atonement is significant for Christians. It pictures Christ’s sacrifice for our sins and that Satan has a role and will be sent away (bound for 1,000 years). While others professing Christianity somewhat understand this, because they do not keep this and the other Christian Holy Days, they often do not have a proper view of God’s plan of salvation, such as the role of Satan and Christ. This Day of Atonement pictures not only what has happened (with Christ) but some of what will happen with Satan (while the holy days that follow show other events that will happen later). This is information that Christians living in these latter days should value. Passover and the Early Church Did the early Christians observe Passover? What did Jesus and Paul teach? You are currently browsing the Church of God News weblog archives for September, 2007.